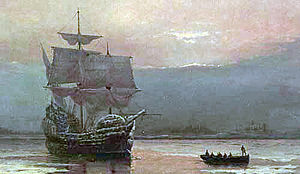 The Mayflower was a boat that carried 102 pilgrims plus 25-30 crew from England to America. It arrived in America in late 1620, after which its passengers created the Plymouth colony. This is seen as the start of English settlers colonising America.. Despite its place in American history, the people aboard Mayflower were not the first Europeans to arrive in the New World. People had been visiting America for a century before the Mayflower arrived (including John Smith, famous for the Pocahontas story), and there were Native Americans who already knew how to speak English. The Mayflower pilgrims also did not establish the first European colony in North America. Started in 1606 to help spread English influence in The New World, the Virginia Trading Company of London established Jamestown in 1607. However, whilst the Jamestown colony was a business venture in which people came to earn money, Plymouth was built by families trying to create a home town, and Plymouth-born Peregrine White was the first English child born by settlers in the New World. This is why Plymouth is viewed by many as the true start of colonising. 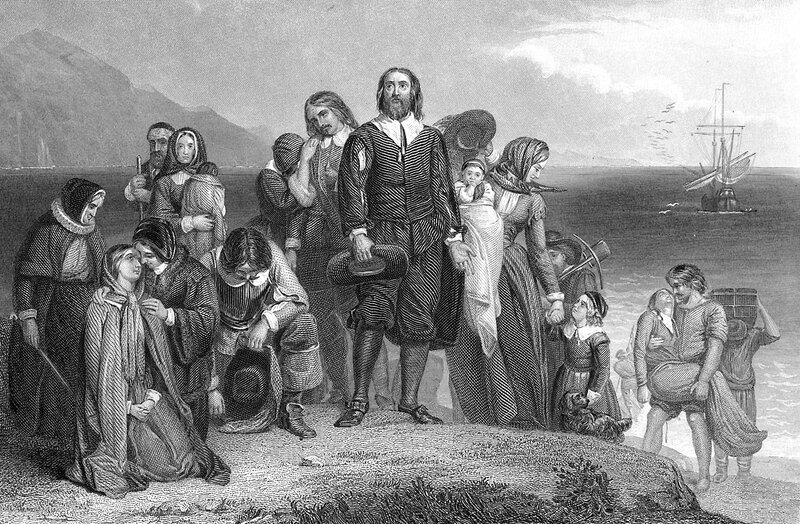 The passengers aboard the Mayflower were Puritans, a Christian group who were unhappy with Catholic influences in the church. The party (102 passengers and at least 25 crew) originally came from around England, but some had moved to The Netherlands prior to their journey. Given permission by the English government to land in Virginia as long as they behaved themselves, they travelled to ‘The New World’ in order to create a society that followed their religious ideals. The Mayflower was not supposed to be the only boat on the journey. However, it’s sister ship ‘Speedwell’ – which had picked up the passengers in The Netherlands – had problems. Twice it was required to return to England, and when it was then judged unsuitable for the journey the passengers reconsidered the journey. Some returned to The Netherlands before The Mayflower sailed to America alone. It set out from Plymouth, England, on September 6th 1620. The boat saw the American coast on November 9th 1620, and took harbour at Cape Cod, where Provincetown now stands. This was far north of where the English government had said they could land, and so the passengers quickly created a legal document saying they would honour the king yet rule themselves through majority vote. This ‘Mayflower Compact’, signed on November 11th by 41 passengers, was done to stop anarchy amongst the passengers and keep England happy. November 11th was also the day some of the passengers came ashore for basic supplies. Despite the passengers’ long trip, they did not rush into establishing their settlement, instead using The Mayflower as their base. For two weeks they assembled a smaller boat which they had brought with them in order to get around the shores, and on November 27th a party was put together to explore the area. However, having reached a month in the area, it is believed they ran into problems with local Native Americans and decided to relocate. Around December 11th a scouting group said they had found a suitable place across the harbour, and on December 18th 1620 The Mayflower anchored again. On December 19th the site was agreed, and construction began on the new colony. Winter, however, was truly setting in and the majority of the passengers spent the season aboard the boat. It is not believed that the weather was particularly harsh for New England that year, but fatigued and malnourished 49 passengers and many of the crew died. On March 21st 1621 the remaining 53 passengers went ashore to establish their colony. They called it Plymouth, named after the English town the boat had left. On April 5th, 1621, the remaining members of the crew took The Mayflower back to Britain, leaving the settlers alone in their colony. The ship arrived back in England on May 6th, a far quicker journey than that to America. Plymouth’s place in history is secure due to being the first civilian-run colony, a pioneer for the ‘The Great Migration’ in the 1630s when many other Europeans came to settle in America. However, in terms of growth it was not a great success and later colonies, established in warmer regions, quickly surpassed it. When reorganisation of the colonies began in 1686, Plymouth was not overly important, and in 1691 the Plymouth group was combined with others. America’s Thanksgiving holiday was officially started by Abraham Lincoln in 1863, over 200 years after the Plymouth colony was created. However, a legend has built up about ‘The First Thanksgiving’, supposedly held in 1621 by the pilgrims in which they celebrated a successful harvest only made possible thanks to Native American help. Records do state that the Plymouth colony did indeed have an event in 1621, which was probably a traditional harvest celebration. Another legend that has grown from a simpler truth is that of Plymouth Rock, a large boulder upon which The Mayflower apparently landed when it reached America. Stepping onto this rock was said to be the first footstep onto American land. However, there is no mention of this story until a man spoke about it in 1741, over a hundred years after the event would have happened. 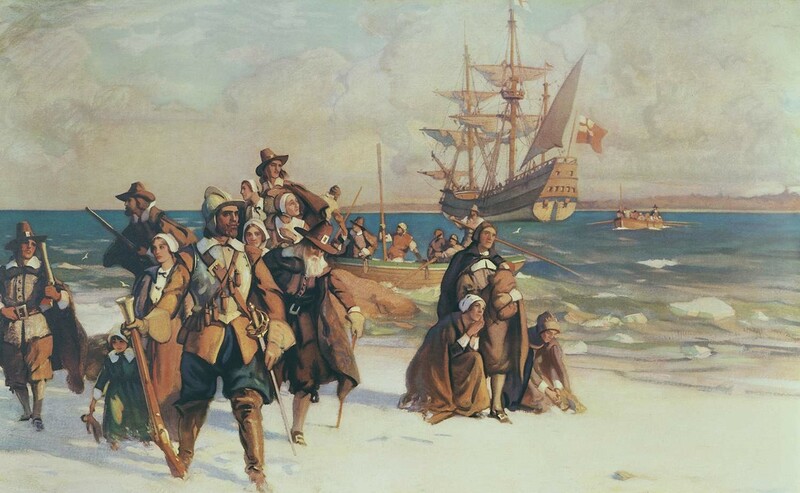 Furthermore, many of the Mayflower passengers had already stepped ashore in November 1620 when the ship landed at the Provincetown portion of Cape Cod. 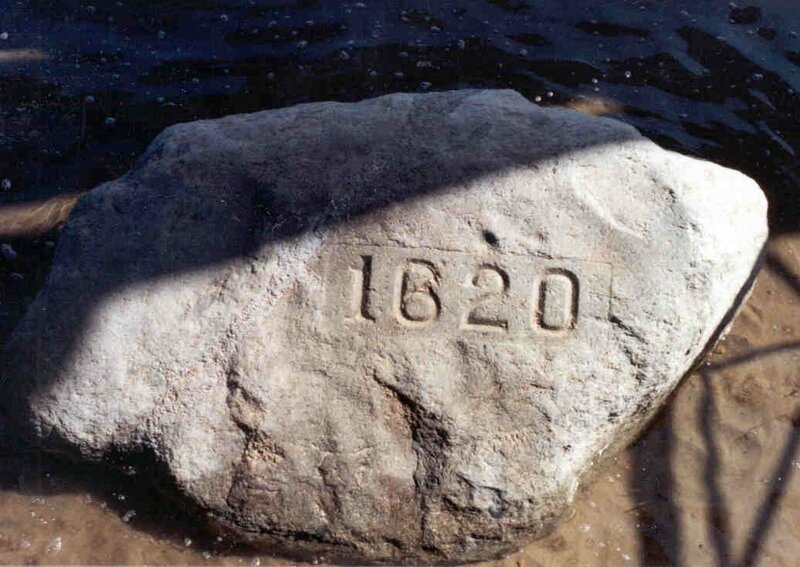 The Plymouth Rock story has been helped by the existence of an actual stone. The rock broke in two in 1774, and many people cut pieces off it in the early years after the story emerged. Of the portion of rock visible above ground, it is estimated only a third remains. Note: In 1751 Britain changed its calendar system, a move which shifted days backwards by 11 days (10 days on the calendar). This means that modern anniversaries of events in Plymouth occur on different dates from when they initially happened. For instance, the arrival of scouts at Plymouth on December 11th is celebrated on December 22nd – itself a miscalculation, as the day should be December 21st.